However, the main problem with hot weather (anything over 20 C) is that the British are totally unprepared for it. Hotel rooms etc are rarely air-conditioned and in my experience the art of designing rooms with a flow-through of air, even with all the windows open, seems to have escaped British architects. Having said that, springtime in the UK can be quite beautiful, and autumn magnificent. They can also be cold, wet and dreary. You pays your money and you takes your choice. 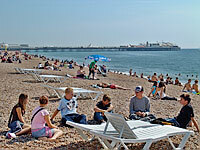 Most people take their holidays in Britain during the summer months in the hope of finding some sun. These people are called optimists (no, just joking). Actually, the weather in the UK does seem to have improved during the last few summers, but you must still expect some days of rain and/or overcast conditions during your London stay. The summer in 2009 was quite wet. Note that it can get quite cool in the UK during spring and autumn, especially in the evening. The average monthly daytime temperature in July rarely exceeds 22 C, and that can easily fall to the lower teens C in October. April temperatures are cooler. Note that evening temperatures may drop sharply.